As I have noted elsewhere, Balibar includes Hegel in his list of transindividual thinkers, but as such he is something of an exception to the list that also encompasses Spinoza, Marx, and Freud. The latter three are foundational to Balibar’s project, appearing as early as Lire le Capital, albeit some between the lines, and have been the subject of books and essays. Hegel has always been an outlier in this sequence, the enemy of Althusser’s early project and only occasionally showing up in later works. This has changed a bit as of late. 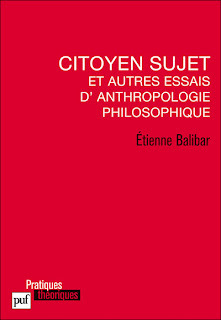 Citoyen Sujet et autres essais d’anthropologie philosophique, Balibar’s latest contains two essays on Hegel, on the Phenomenology of Spirit specifically. Both of these essays are dedicated to the transindividual dimension of Hegel’s thought, and are centered around a reading of a particular phrasing of this relation. The first is dedicated to Hegel’s formulation of “Ich das Wir, und Wir, das Ich ist,” a sentence that could be translated as "I that is a we and we that is I." Balibar is interested in the particular grammar of this formulation, and its repetition; it is a repetition of other formulations, such as Ich=Ich and the history of the mediation first person, on what it means to say "I" throughout the history of philosophy, and is repeated throughout the Phenomenology. It is a formulation of Spirit, of transindividual recognition. Balibar’s second essay is also dedicated to a particular formulation in Hegel’s text, one that is repeated. This formulation “is the work of all and each,” (“das Tun aller and Jeder”), which is also a formulation of Spirit considered in its active dimension. As with the first formulation, its particular repetition throughout the Phenomenology is one of a transformation, each repetition in the different figures of Spirit is an approximation of this ideal. What is interesting is how these two different formulations intersect. The first frames spirit in terms of the universal, in the recognition of the individual in the universal and vice versa, while the second does so in terms of the common, in the work of the community. The contradiction between universality and community, or the common, defines each historical moment in the history of spirit. 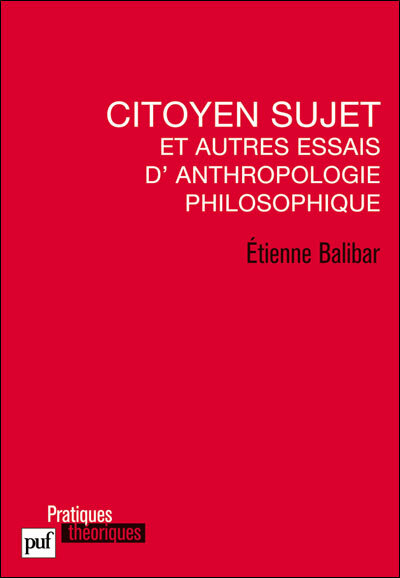 Balibar argues that it negates and preserves the contradiction of certainty and truth that drives the first section of the Phenomenology, moving the epistemological conflict over knowledge into a conflict over the nature of social belonging itself. Balibar draws a few interesting, and heterodox conclusions from this relation. First, he says every historical moment as caught in this conflict. There is no universal of the universal, no meta-language of social belonging itself. Which is why this very problem cannot be stated as such, in some kind of logical formulation, but must be given through the well known historical moments that color the dialectic of spirit, Antigone’s conflict, the Roman World, the Enlightenment, the Terror, etc. Second, there is a tragic dimension to this conflict, the more a given historical moment sees itself as universal, expressing everything in the language of duty to the city, law, reason, etc., the more it comes into conflict with itself, with its unstated commonality. It turns out that there is an irony to every community. Balibar even goes so far to argue that this makes the Phenomenology one of the grand enterprises of ideology critique: it recognizes the constitutive misrecognition of every society of every historical moment. The moment when a society attempts to comprehend itself as universal is the moment when it confronts the limit of that universality. About that absolute, Balibar points out that Absolute knowledge is not given in the form of a community, there is no community of sages. It is because of this, because of the form of absolute knowledge provided without content, that there has been so much confusion and debate over the “end of history,” which would be a community of the universal. Balibar’s reading of Hegel is strikingly similar to Jameson’s on at least two points. First, and without any real reference to Mao, there is the idea of the dialectic itself dividing into two, into a dialectic of recognition and a dialectic of action, two dialectics that never quite match up in the relation of the universal to the common. Second, because of this division, they both argue for a Hegel without an absolute, a Hegel of finitude but not the finitude of death, of Kojève’s Heideggerian struggle, but of the finitude of every social formation, or ideology. It is a Hegel for post-Hegelian times, I will leave the Hegelians (or Zizek’s forthcoming magnum opus) to explain why this is not Hegel at all. In the meantime here is a review I wrote of the translation of Macherey’s Hegel or Spinoza.